Margaret Dunning told us that her bucket list was complete. 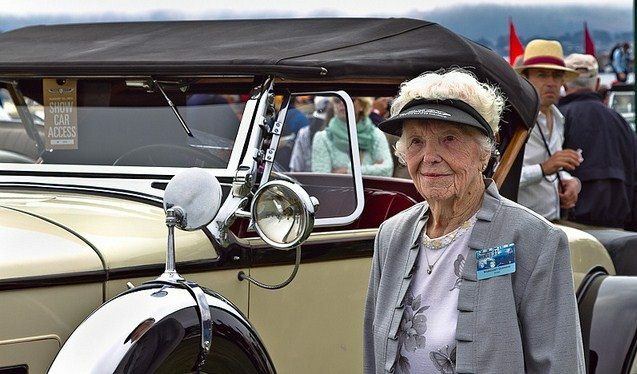 The 104-year-old matriarch of the classic car community passed away Sunday doing what she loved best – driving in a classic car rally and raising money for charity. Margaret was in California to participate in the ELK Charity Challenge, and earlier in the day she had visited Jay Leno’s extensive collection in Burbank. Leno changed his plans so he could be at the garage, waiting for Margaret with a nice bouquet of flowers. Margaret and two close friends had flown to California from her home in Michigan, but she probably would have preferred to have driven. Yes, at age 104, she was still driving. I had the pleasure of escorting Margaret around the showfield at a CCCA event at the Gilmore Museum a few years ago, and she was truly an inspiration to all who met her. Born June 26, 1910, her history with cars traces to the days when Margaret, an only child, served as “gopher” for her father, Charles Dunning, as he sent her to fetch tools as he worked on cars and farm equipment. 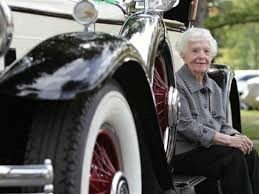 Even as a centenarian, she did her own oil changes and helped with the mechanical work needed to maintain her cars. Margaret began driving at age 8. Her father died when she was 12. Because of severe arthritis, Margaret’s mother couldn’t drive so Margaret inherited all family driving duties. She bought her beloved 1930 Packard 740 Roadster because she had wanted one when the car was brand new, but her mother said she didn’t want to ride in an open car and insisted they buy a Packard sedan instead. She became well-known, even beyond the classic car community, when The New York Times published a feature story four years ago about the woman who was 30 years older than her award-winning 1930 roadster. 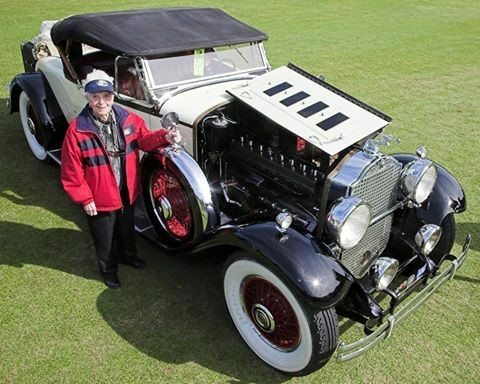 Margaret was honored at nearly every major Concours event in the country, and was a stalwart member and supporter of the CCCA.